When mixing essential oils for topical application, it’s almost always recommended to dilute them with a carrier oil. Most of us are very familiar with a select few carriers such as coconut, olive, jojoba and sweet almond oils. However, the list of possible carrier oils which may be used with your essential oil blends is actually quite long! All of the different oils have their own unique traits based on the essential fatty acids and nutrients they contain. These characteristics make each individual carrier ideal for different situations based on such factors as skin-type, how long you may wish to store the mixture, or how you intend to apply it to your body. 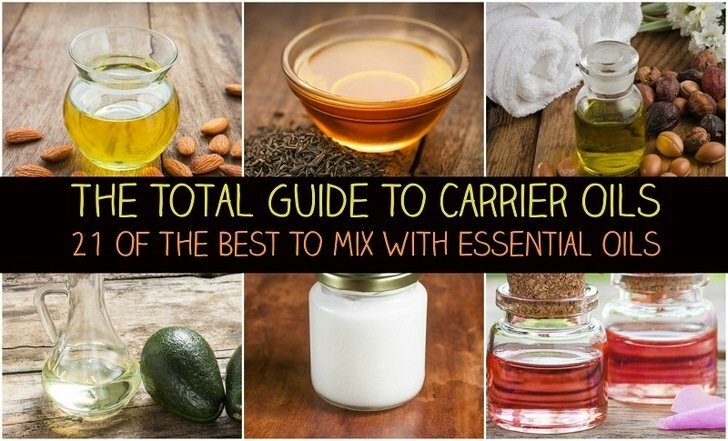 Here we will cover 21 of the common and not-so-common carrier oils; including a short description of each one, as well as their associated health benefits. Then we’ll close with a brief description of the primary fatty acids contained in the carrier oils. Looking to buy any of the carrier oils mentioned? Most of the oils mentioned in this article can be purchased from Plant Therapy – our favorite supplier of essential oils and aromatherapy goodies. You can browse their selection here. Obtained from the dried kernels of the almond tree (Prunus amygdalus var. Dulcis), sweet almond oil is one of the more well-known carrier oils. It is rich in antioxidant vitamin E which is also a highly nourishing vitamin for promoting skin cell regeneration. Sweet almond oil helps to balance skin’s natural oils and prevent excessive drying by locking in existing moisture. This makes the oil especially beneficial for very dry or irritated skin. However, it is also suitable for all skin types. As it hydrates and nourishes skin, sweet almond oil also relieves inflammation and irritation. It also provides a good amount of natural resistance against sun damage by boosting antioxidant levels in the skin. Sweet almond oil is ideal for massage oil blends as it doesn’t soak in overly fast. It is also perfect in facial moisturizing blends due to its ability to promote younger-looking skin without feeling greasy on the face. You can read more about this incredibly versatile oil in 12 Benefits Of Sweet Almond Oil For Beautiful Skin & Hair & Improved Health. If you’d like to give it a try, pick up a bottle of Sky Organics 100% Pure, Cold-Pressed, Organic Sweet Almond Oil for an excellent, high-quality product. Apricot kernel oil is extracted from the stones from apricots harvested from Prunus armeniaca, the most commonly cultivated species of apricot tree. This carrier oil absorbs quickly and has a very fine texture which makes it suitable for use on oily skin. Due to its texture, and also for its anti-aging qualities, apricot kernel oil is a perfect carrier for facial massage and moisturizing blends. It also possesses anti-inflammatory properties which make it a good choice for whole-body massage blends, as well as for soothing dry, sensitive or irritated skin. If you’d like to give it a try, pick up a bottle of this Dr Adorable Organic Pure Cold Pressed Apricot Kernel Oil. Cold-pressed from the fruit of the Morocan Argan Tree (Argania spinosa), Argan oil has many uses – both internally and externally. This oil is particularly rich with antioxidant vitamin A which significantly increases cellular regeneration. It also provides some natural protection against sun and other forms of environmental damage. It can be used to help heal and soften skin to prevent the formation of stretch marks, as well as scarring from small wounds. On the skin, argan oil makes a wonderful carrier for anti-aging oil blends. It can also be used in nail and cuticle oils to promote healthy growth. Argan oil is most well-known for its ability to improve strength and appearance of hair. Use it as a carrier for oil blends meant to repair split ends to experience Argan’s full potential. You can read more about this popular oil in 17 Benefits of Argan Oil For Skin, Hair & Health. Ready to try it out? You can purchase a bottle of Pura D’or 100% Pure Organic Moroccan Argan Oil here. The fruit of the avocado tree (Persea americana) is approximately 30% oil; and it provides one of the thickest and most nourishing carriers on our list. Avocado oil is the only one of our carrier oils which contains significant quantities of palmitoleic acid – a fatty acid which is naturally present in human adipose tissues. Because it is a lipid which our bodies recognize as “familiar”, palmitoleic acid absorbs into and provides nourishment to skin’s lower layers. This makes avocado oil ideal for mature skin which tends to be thinner with a much slower rate of cellular regeneration. Avocado oil is very thick and has a slow drying time, which makes it a good base for aromatherapy massage oil blends. To create a lighter-textured blend using avocado oil, mix it with around 20% sweet almond oil. The fatty acids in avocado oil are naturally anti-inflammatory. The oil also possesses many vital nutrients and antioxidants; including chlorophyll, lecithin and potassium, as well as vitamins A, D and E. As such, it is extremely effective in oil blends for treating inflammatory skin conditions like eczema and psoriasis. It is also an ideal carrier in blends purposed for repairing damaged tissue. You can read more about this carrier in 10 Amazing Avocado Oil Benefits For Your Health & Beauty. Also, pick up a bottle of Belleza Solutions 100% Pure Cold-pressed Avocado Oil, if you’d like to try it out for yourself. The oil of the coconut fruit (Cocos nucifera) is currently the reigning king of all carrier oils. 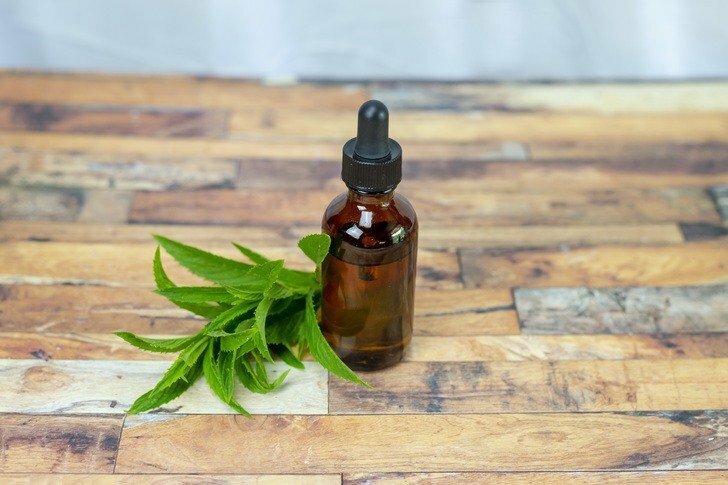 This one oil provides an almost unbelievable number of health benefits for skin and also for hair – as well as being a popular and nutritional food source. Just to name a few, coconut oil is naturally antioxidant, anti-inflammatory, anti-fungal and antibacterial; and it can help balance your blood-sugar, blood pressure, cholesterol and hormone levels. Coconut oil is cleansing and nourishing for skin, hair and nails; it is known to prevent seizures for children with drug-resistant epilepsy; and it is thought to be a preventative for certain forms of cancer. As if that we’re enough, using coconut oil (internally and externally) can actually make your whole body smell better! Also, if you don’t already have a jar of CO laying around the house, you’ll definitely be needing one of those. For consistently high-quality (and delicious flavor), we recommend this Nutiva 100% Organic, Unrefined, Cold-Pressed, Virgin Coconut Oil! Similar in appearance and texture to coconut oil, Babassu (Attalea speciosa) also possesses many of the same health benefits as its coconut cousin. This is because Babassu oil contains many of the same fatty acids as coconut. In fact, there are only three major noticeable differences between the two oils. The first is that Babassu doesn’t smell nearly as fruity. This makes it better for blending essential oils whose scents clash with the aroma of coconut. Second, Babassu soaks in quite a bit faster than coconut oil. So it doesn’t leave skin feeling as greasy and it’s better for oily skin types. Also, because it doesn’t linger on your skin as long as coconut, Babassu oil tends to create less mess on your clothes, furniture, the screens of phones and tablets, or (heaven forbid) your doorknobs. The third and most intriguing different between the two oils is that Babassu creates a cooling sensation when it comes into contact with skin. This and its lighter texture make it ideal for many summertime blends where you want to keep cool and still provide your skin with the nourishment of lauric acid. You can read all about coconut oil’s quirky cousin in 17 Reasons You Need Babassu Oil In Your Life! Also, when you’re ready to try it out, I highly recommend this Dr Adorable 100% Pure Organic Cold-pressed Babassu Oil. Black cumin seed oil (also commonly referred to as simply black seed oil) is extracted from the seeds of Negella sativa, the black caraway flower. Of all of the natural plant oils in the world, black seed oil has the highest ratio of omega-6 to omega-3 fatty acids – at 56:1. This super-concentration of omega-6 (linoleic) fatty acid has led many people to call black cumin seed “the cure for everything but death”. It’s list of health benefits include anti-cancer, anti-fungal and powerful anti-bacterial properties. Black seed oil is also known to boost immune function, promote liver and cardiovascular health, lower blood pressure and balance blood sugar, aid with weight loss, stimulate cellular regeneration to help heal skin and prevent scarring, as well as to shield the mind against neuro-degenerative diseases. That said, you can use black cumin seed oil as a carrier for just about anything you want. It’s just that good for your body! You can catch all of the incredible details in this article. When you’re ready to purchase a bottle, try this Kiva Organic Cold-pressed, Raw Black Seed Oil. Borage seed oil is harvested from Borago officinalis (commonly known as the “starflower”); and it is the richest known natural source of gamma-linolenic acid (GLA) – one of the healthiest fatty acids in exsitence! It’s super-high concentration of GLA makes borage seed oil one of the best natural anti-inflammatory carriers around. It is great for all skin types. Though, borage seed is especially beneficial for healing and soothing dry, damaged or irritated skin, as well as for strengthening and nourishing mature skin. Use borage seed as a carrier for anti-aging oil blends to give them a powerful extra kick! Another incredibly popular carrier oil which provides some pretty outstanding benefits is flaxseed. Also known as linseed oil, it is extracted from the seeds of Linum usitatissimum, the flax plant. Flaxseed is the richest source (by concentration) of alpha-Linolenic acid in the natural world. This ranks it among the best-of-the-best for natural carrier oils. It is a natural anti-inflammatory which is so effective that flaxseed oil is even recommended for treating rheumatoid arthritis. Use it for topical pain-relief blends, as well as to soothe inflammatory skin conditions such as eczema and psoriasis. Check out these 14 Fascinating Reasons to Eat More Flaxseed to get a better idea of just how incredible this little seed really is! If you’re ready to purchase a bottle, give this Puritan’s Pride Organic Flaxseed Oil a try! Hazelnut oil is pressed from the roasted kernels of Corylus avellana, the common hazel tree. As one might expect, this carrier has a mild nutty aroma similar to that of a whole hazelnut. This carrier is beneficial in oil blends designed for acne-prone skin, as well as for other inflammatory skin conditions. Hazelnut oil absorbs fairly easily into skin, softening and moisturizing as it does. Due to its nutty scent, this carrier also makes a great base for many earthy, spicy and woody aromatherapy blends. If you love the taste of hazelnuts, this is one carrier that you must try. Pick up a bottle of Organic Cold-pressed Hazelnut Oil here. Because hemp seed oil is sources from Cannabis sativa, this carrier has earned an unjustifiably bad reputation. In reality, hemp seed is one of the healthiest carrier oils on our list. With it’s rich concentrations of Linoleic and alpha-Linolenic acids, hemp seed oil provides some pretty potent health benefits when used either internally or externally. As a carrier oil, hemp seed is a powerful anti-inflammatory and a natural antioxidant. It promotes skin healing and regeneration, while working to prevent blemishes and pre-mature aging. Because it also possesses a light, non-greasy texture, hemp seed is ideal for use in facial oil blends for all skin types. Furthermore, hemp seed oil is a natural analgesic. Use it as a base for topical pain-relief blends or for deep tissue massage oils. Learn more about this incredible, under-rated oil in 12 Ways Using Hemp Seed Oil Will Improve Your Health & Your Life. If you’d like to purchase hemp seed oil, you can pick up a bottle of Herbal Choice Mari Organic Hemp Seed Oil here. Jojoba oil is extracted from the seeds of Simmondsia chinensis, the jojoba tree. Technically a wax, not a true oil, jojoba contains some of the longest-chain fatty acids of any of the carriers on our list. The primary constituents in Jojoba oil are non-digestible for humans. However, the combination of fatty acids in the oil mimic our skin’s natural sebum so closely that jojoba absorbs better than most other carriers. Jojoba is a natural fungicide, making it ideal for oil blends meant to treat topical fungal infections. It is also deeply nourishing for skin, hair, nails & cuticles. This – combined with its rapid absorption rate – makes jojoba an excellent carrier for all types of topical moisturizers. Furthermore, jojoba’s unique fatty acid profile give the oil a very long shelf-life. When mixed with other carrier oils, jojoba confers its resistance against oxidation to the other oils in the blend. Be sure to check out these 12 Surprising Benefits Of Jojoba Oil For Beautiful Skin & Hair to get more tips on how to use this unique carrier. If you’d like to purchase a bottle of jojoba, we recommend Leven Rose 100% Pure Organic, Unrefined Cold-Pressed Jojoba Oil for consistent quality. Kukui nut oil is harvested from the seeds of Aleurites moluccans, also known as the “candlenut” tree. It is a light-weight oil which is excellent for those who want a good nourishing carrier oil that won’t leave behind a greasy film. Kukui nut oil is nourishing for both the skin and the hair and makes a wonderful base for massage oils. You can also use kukui as a carrier in oil blends for moisturizing skin, treating acne, or conditioning the hair and scalp. Kukui is also very soothing for damaged skin. Specifically, kukui nut oil is most effective in oil blends for relieving the pain and discomfort of burns caused by over-exposure to sun or those resulting from chemotherapy radiation. Please note that kukui nut oil oxidizes much more easily than many of the other carriers on our list. Therefore, it should always be stored in a cool, dark location to prolong its shelf-life and preserve quality. If you’d like to try out this delicate, nourishing carrier; you can pick up a bottle of Dr Adorable Pure Organic, Cold-Pressed Kukui Nut Oil here. One of the most popular cooking oils in the world, olive oil (extracted from the fruit of Olea europaea) has far more uses outside the kitchen than within it. Olive oil is best known for it’s rich oleic acid content – the highest of any natural source. Indeed, “oleic” is literally translated from Greek as “relating to or derived from olive oil”. Olive oil has a long list of incredible health benefits when ingested; not the least of which include better cholesterol and cardiovascular health. However, as previously mentioned, olive oil goes way beyond cooking. You can use it on just about any skin type as the oil is fairly light and won’t clog pores. Furthermore, the herbaceous aroma of olive oil allows this carrier to meld very well with most scent categories of essential oils. Olive oil is also perfect for blends which moisturized and repair damaged hair as it dries relatively fast and won’t leave your locks looking to greasy or weighted-down. One word of caution: When choosing an olive oil, beware of “cheap” brands as these oils are usually mixed with less-expensive (and unhealthy) vegetable oils in order to cut manufacturing costs. If you’re not certain which brands are the ‘bad-guys’; it’s better to err on the side of caution. Consider giving this Bragg Pure, Unrefined, Organic, Extra Virgin Olive Oil a go. It has an amazing flavor and it’s guaranteed to be 100% pure olive oil! Palm kernel oil, harvested from the fruits of Elaeis guineensis (also known as the African oil palm) should not be confused with palm oil. Though they are derived from the same tree, these two oils are almost polar opposites. Whereas palm oil primarily consists of palmitic and oleic oils, and is liquid at room temperature; palm kernel oil has a higher melting point, similar to coconut and babassu oils. As with coconut and babassu, palm kernel oil is rich with skin-nourishing vitamins and antioxidants which confer a wide variety of health benefits. Pomegranate seed oil contains a rare form of linolenic fatty acid – conjugated linolenic acid (CLA), also known as Punicic acid. Named for the pomegranate shrub (Punica granatum), punicic acid is found in its greatest quantities only in pomegranate seeds; and it is responsible for the majority of the oil’s health benefits. Just like the rest of the fruit, pomegranate seed oil is powerfully antioxidant and anti-inflammatory; and it is known to significantly boost epidermal cellular regeneration. This makes pomegranate seed oil one of the absolute best oils for anti-aging blends, as well as those meant to heal damaged skin. Try it out for yourself with this Dr Adorable 100% Pure Organic Pomegranate Seed Oil! Oil pressed from the seeds of the evening primrose (Oenothera biennis) is prized for its ultra high concentration of gamma-linolenic acid (GLA). The oil has long been used to treat everything from digestive disorders to hormone imbalances in women. In oil blends, use evening primrose oil for clearing up acne or inflammatory skin conditions like eczema. It is also great to include in scalp treatments to clear up dandruff, prevent hair loss or to promote the growth of stronger, healthier hair. You can read more about it in 7 Sensational Benefits of Evening Primrose Oil. When you’re ready to experience the magic of evening primrose oil for yourself, try this Renewalize Organic, Cold-pressed Evening Primrose Oil! Rosehip seed oils is extracted from the seeds of Rosa moschata, the musk rose. Not to be confused with the rosehip fruit, rosehip seed oil contains no vitamin C (a popular misconception). However, it does contain something much better than that – all-trans retinoic acid, a natural form of vitamin A. That and the oil’s high concentration of alpha-Linolenic acid make rosehip seed oil one of the most sought after carriers for natural skin care. Use rosehip seed oil in blends for anti-aging, fading scars, soothing away redness and irritation, preventing stretch marks and clearing up blemishes; just to name a few. Check out these 9 Beauty Secrets Of Rose Hip Seed Oil to learn more. When your ready to try it out, pick up a bottle of this Radha 100% Pure, Organic, Cold-pressed Rosehip Seed Oil. While most people consider sesame (Sesamum indicus) oil to be a food, it can also be used as a carrier oil. Sesame oil provides rich concentrations of vitamins E and B-complex, as well as calcium, magnesium, phosphorus, protein and lecithin. Sesame is a thick oil that provides excellent, deep moisturizing for soothing very dry or irritated skin. Use it in blends meant for treating eczema, psoriasis or other inflammatory skin conditions. Sesame oil is also great for revitalizing older, more mature skin types. Because sesame oil is very thick on its own, you may wish to blend it with another lighter carrier to reduce the viscosity of the oil. Think you want to give sesame oil a try? Check out this Life-Flo Pure Organic, Cold-pressed Sesame Oil. Tamanu oil is extracted from the nuts of the Ati tree (Calophyllum inophyllum) of southeast Asia and the Pacific islands. The oil is well-known as one of the best skin-healing and rejuvinating oils available, making it particularly useful in anti-aging blends. Tamanu is also a natural antioxidant and anti-inflammatory, as well as anti-bacterial. As such, you can also use tamanu for oil blends intended to clear up acne or other inflammatory skin conditions. Because it works to greatly speed skin cell regeneration, tamanu oil can also be used to promote healing and prevent scarring from wounds. If you’d like to try Tamanu Oil, try this RejuveNaturals 100% Pure, Organic, Cold-pressed Tamanu Oil. Just like it sounds, wheat germ oil is extracted from the heart (aka “germ”) of Triticum durum (aka wheat) grains. Of the entire wheat grain, the germ makes up only about 3% of its entire weight. However, it contains approximately 25% of the grain’s proteins, vitamins and minerals. Wheat germ oil is very high in vitamin E – one of the best natural sources around. It is also a natural antioxidant which can help to prevent oxidation when combined with other oils. For this reason, wheat germ oil is often combined with other carrier oils to extend their shelf life. Use wheat germ oil in blends meant to promote skin cell regeneration, repair sun or environmental damage or heal scars. It can also increase an oil blend’s ability to reduce signs of aging and restore elasticity to skin for a more youthful appearance. Wheat germ oil is anti-inflammatory and can be added to a blend to relieve symptoms of dermatitis. Keep in mind, however, that wheat germ oil is very stick and heavy by itself. Thus, you will probably want to mix it (around 10%) with another carrier oil (90%) as opposed to using on its own. Ready to try it out? Pick up a bottle of this Dr Adorable Pure, Unrefined, Organic, Cold-pressed Wheat Germ Oil. Natural carrier oils owe the majority of their health benefits to the essential fatty acids (EFAs) they contain. For all of the carriers reviewed above, we listed the major EFAs, as well as how much (on average) of each individual fatty acid those oils contain. For your convenience, the following are short descriptions of the primary EFAs found in our 21 carrier oils; including the oils they are most prevalent in and what exactly each fatty acid does to benefit the human body. Oleic acid is an 18-carbon chain, monounsaturated omega-9 fatty acid. It is found in most plant oils; specifically olive oil from which it gets its name. The Greek work “oleic” means “related to or derived from olive oil”. Some of oleic acid’s more prominent health benefits revolve around improving cardiovascular health. It is best know for its ability to decrease LDL “bad” cholesterol while increasing HDL “good” cholesterol, as well as for reducing blood pressure. Oleic acid is also well-known for being a powerful natural anti-inflammtory, as well as for improving insulin sensisitivity (i.e., reducing insulin-resistance) by protecting insulin-secreting pancreatic beta cells. Also known as dodecanoic acid Lauric acid is a 12-carbon medium-chain, saturated fatty acid. It is found in palm fruit carriers like coconut, babassu and palm kernel (but not palm) oils. Lauric acid oxidizes slowly and is highly resistant to heat. As such, oils containing lauric acid tend to have a much longer shelf life than those that don’t. It is known for its ability to improve HDL “good” cholesterol levels. Lauric acid is also powerfully anti-microbial and provides deep moisturization and nourishment for skin. These traits make lauric acid-containing oils ideal for blends which are intended to treat skin disorders or severly dry skin. Also known as tetradecanoic acid, myristic acid is a 14-carbon long-chain, saturated fatty acid. Like lauric acid, it is a common constituent in palm fruit oils like coconut, babassu and palm kernel. Like lauric acid, myristic acid is deeply moisturizing. It also absorbs quickly into skin which makes oils containing this fatty acid ideal for treating very dry or under-nourished skin. Often referred to as decanoic acid, Capric acid is a 10-carbon medium chain, saturated fatty acid. It is prevalent in oils like coconut and palm kernel. Capric acid is known for its ability to help prevent seizures as part of the ketogenic diet. It also aids in speeding cellular regeneration, as well as for increasing metabolism and promoting weight-loss. Also known as octanoic acid, caprylic acid is an 8-carbon medium chain, saturated fatty acid. Like capric acid, it is found primarily in coconut and palm kernel oils. Caprylic acid is best known for being a powerful anti-microbial. Like other medium-chain saturated fatty acids, caprylic acid promotes increased metabolism and faster weight-loss when taken internally. Linoleic acid is an 18-carbon chain, polyunsaturated omega-6 fatty acid which is found in the majority of seed oils. It is closely related to oleic acid and provides similar benefits for improving cardiovascular health and reducing inflammation. Alpha-Linolenic acid (ALA) is an 18-carbon chain, polyunsaturated omega-3 fatty acid. It is found in its highest concentrations in flaxseed oil. Other oils containing significant amounts of ALA include hemp seed, kukui nut, rosehip seed and wheat germ oils. ALA oxidizes faster than most other fatty acids. For this reason, many oils with high ALA concentrations must be mixed with other more stable carriers to increase shelf-life. Punicic acid, also known as trichosanic acid or conjugated linolenic acid (CLA), is is an 18-carbon chain, polyunsaturated fatty acid. It is found primarily in pomegranate seed oil. Punicic acid is known for having potent anti-cancer properties, specifically against prostate cancer. It is also useful for supporting weight-loss, boosting metabolism and helping to build lean muscle mass. Gamma-linolenic acid (GLA) is an 18-carbon chain, polyunsaturated omega-6 fatty acid. GLA is found in its highest concentration in evening primrose oil. It is also prevalent in seed oils such as hemp and borage. GLA is well-known as a powerful natural anti-inflammatory. It is effective for treating inflammatory skin conditions like acne, eczema and psoriasis. It also helps to boost the immune system and promote hormone balance. Palmitic acid, also known as hexadecanoic acid, is a 16-carbon long-chain, saturated fatty acid. As the name implies, palmitic acid is a major component in palm fruits. But it is also the most common saturated fatty acid found in plants and animals, in general. When consumed in excess, palmitic acid is thought to increase risk of heart disease by increasing LDL “bad” cholesterol. However, this effect is mitigated somewhat when palmitic acid is combined with other healthier fats. Also known as hexadecenoic acid, palmitoleic acid is 16-carbon chain, monounsaturated omega-7 fatty acid that is naturally synthesized from palmitic acid by the human liver. Palmitoleic acid is on of the main components of avocado oil. Palmitoleic acid is a natural anti-inflammatory. Like oleic acid, palmitoleic acid improves the body’s sensitivity to insulin by protecting insulin-secreting pancreatic beta-cells. 11-Eicosenoic acid is a 20-carbon chain, monounsaturated omega-9 fatty acid. It is found in a variety of plant and nut oils. While not toxic to humans, 11-eicosenoic acid is non-digestible and will cause loose stools if consumed in excess. Most noteably, jojoba oil contains high concentrations of both 11-eicosenoic and erucic acids in the form of wax esters. While not safe to ingest, these fatty acids mimic the chemical structure of human sebum; and thus they are absorbed very quickly when applied topically to the skin. Also known as octadecanoic acid, stearic acid is an 18-carbon chain, saturated fatty acid. It is also one of the most common saturated fatty acids found in nature, second only to palmitic. While it is present in the majority of plant oils, stearic acid usually represents only a small percentage of their total lipid content. Tamanu oil is one exception, as it possesses a significantly higher concentration. Carriers with higher stearic acid content tend to be heavier and absorb more slowly than other oils. When applied to skin and hair, they help to seal in moisture, which can be especially helpful in very dry climates.